A deliciously satisfying way to add healthy green foods to your diet! 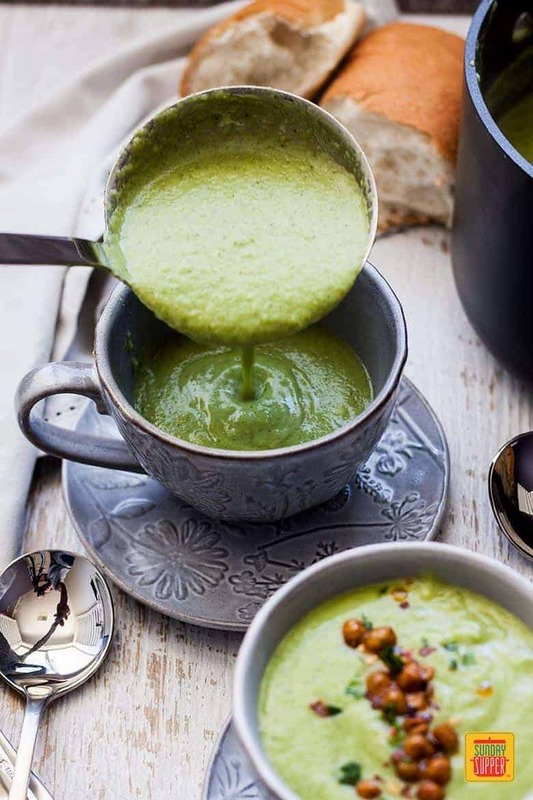 This thick, Easy Broccoli Soup is perfect for a supper starter, easy lunch or midweek meal. It’s quick to throw together, totally nourishing, feel-good food that gets a nice crunchy kick from the Spicy Roasted Chickpeas scattered on top. Ready for something comforting and healthy? Right after the holidays I always crave something nourishing but let’s not mess about here, it’s no secret I’m a comfort food person. 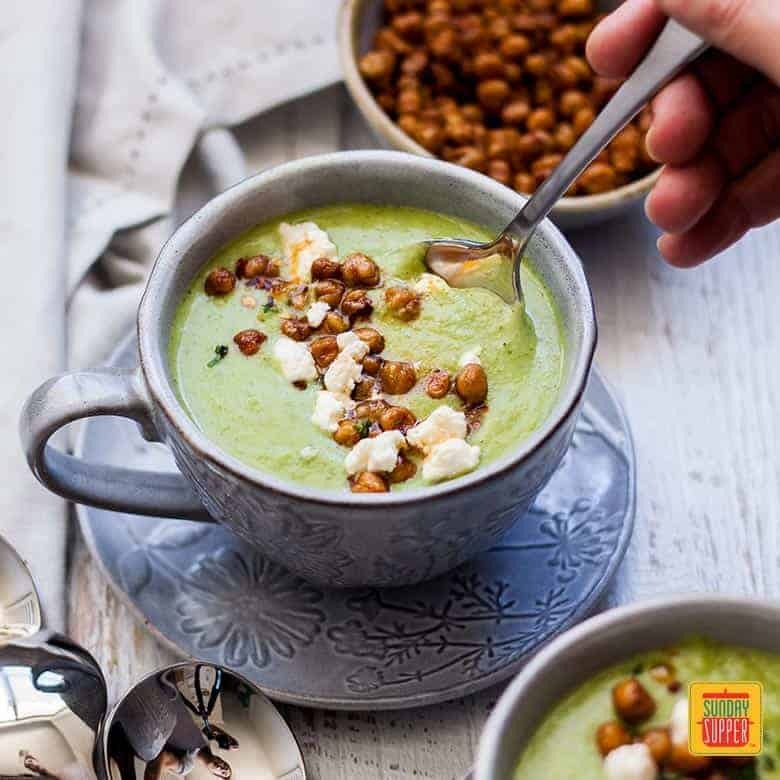 Here’s the thing, nourishing and comfort food don’t have to be mutually exclusive and the proof is this Easy Broccoli Soup with Spicy Roasted Chickpeas recipe. I have a confession to make. I ate lots of chocolate over the holidays. Lots. Oh and then there was all the wine and cheese. Leftover Turkey Grilled Sandwiches. Yes, I need something healthy but also healthful, stat! Are they 2 different things? It feels different to me. I want it to be nourishing for my body but I also want to feel satisfied and like I just ate something lovely. 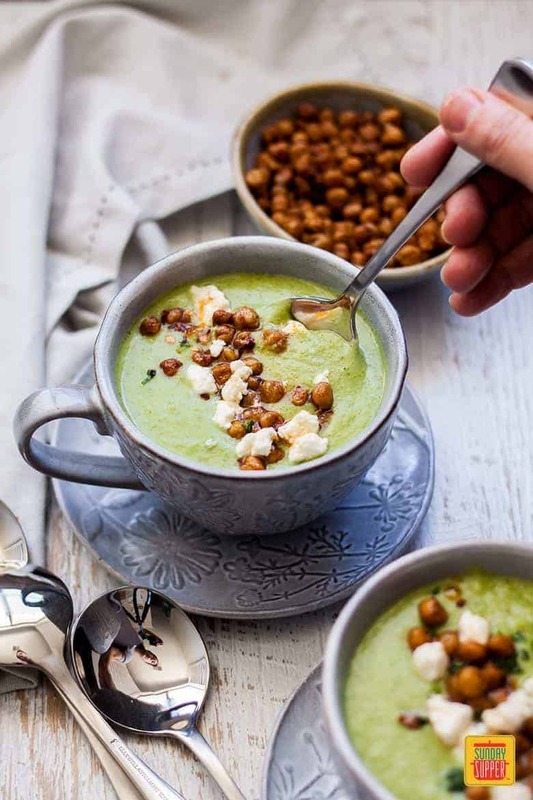 Enter lots of healthy green foods recipes like this Easy Broccoli Soup! 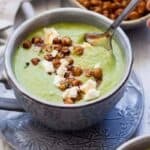 Let me introduce you to my easy Broccoli Soup. A healthy green meal must be good, right? Yep, it is, but it’s also super flavorsome and comforting all at once. I totally adore this soup and I will now make this over and over and over, whenever I need to eat something that makes me feel, just, you know, good. Before making this, I had never had Broccoli soup. Maybe broccoli in a soup but not broccoli soup. I’ve been seriously missing out. The creaminess in this easy broccoli soup comes from peas and hummus. That’s it. There is no actual cream or milk in the soup, keeping those unnecessary calories at bay. But wow, talk about a flavor hit! Starting with leeks, celery and garlic, this soup is always going to be full of flavor. The Spicy Roasted Chickpeas are something I’ve been wanting to make for nearly forever, and they didn’t disappoint. They’re crispy and crunchy and salty and totally moreish. I kept the leftovers sitting on the kitchen counter and every time I walked past, I would keep grabbing a few. Oops. They sit nicely on top of the soup and add a little crunch when needed. I also scattered over a little Persian feta because, well, why not? 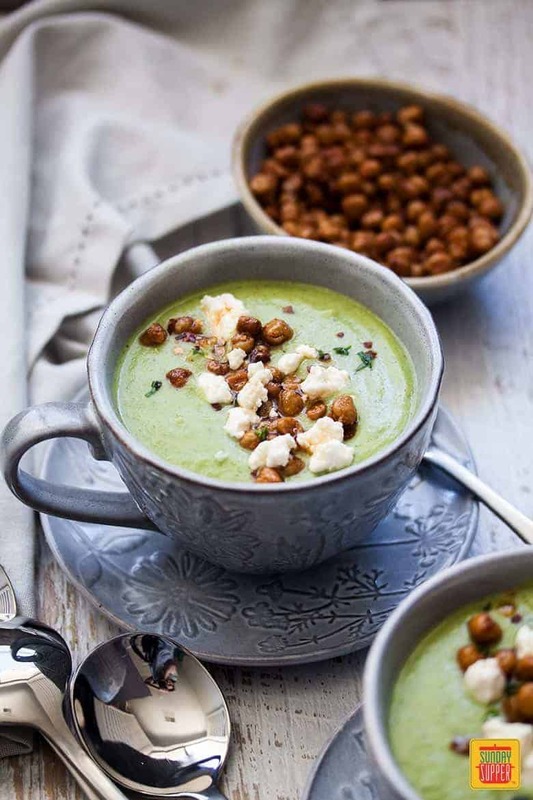 Easy Broccoli Soup with Spicy Roasted Chickpeas Tips and tricks. Don’t overcook the broccoli and peas. Cook just until tender otherwise you’ll lose that amazing vibrant color. It’ll still taste great but just not look as bright. Vegetarian option? Replace the chicken stock with vegetable stock. Broccoli is such a versatile vegetable too. I love how it can be used in everything from stir-fries like this Chinese Broccoli and Beef right through to comforting salads like this Lighter Broccoli and Cauliflower Salad with Bacon. And, of course, this delicious easy Broccoli Soup. This easy Broccoli Soup would make a great starter but, because it’s thick, it also goes very nicely as a main dish. It takes less than half an hour to make, meaning it’s just the perfect healthy green meal for a quick lunch or even a light dinner, midweek. Add some fresh bread and you’re in gorgeous, thick soupy heaven. Looking for more quick and healthy recipes? How about this Quick and Healthy Turkey San Choy Bow or some Beef Shish Kebabs with Mojo Verde – both perfect for a Sunday Supper or a midweek meal. This thick, easy Broccoli Soup is just perfect for a supper starter, easy lunch or midweek meal. It’s quick to throw together, totally nourishing feel-good food and gets a nice crunchy kick from the Spicy Roasted Chickpeas scattered on top. Preheat the oven to 200C / 400F / 180C fan forced. Line a large baking tray with baking paper. Drain and rinse the tin of chick peas, then dry thoroughly using paper towel. Tip the chick peas onto the prepared baking tray and coat with the oil and salt. Bake for around 30 minutes making sure to give them a mix every 10 minutes. When done they’ll be darkened, golden and crispy. remove the chick peas from the oven, tip into a bowl and mix with the chilli powder and garlic powder. In a large saucepan over medium heat, saute the leek, garlic & celery in the oil. After about 5 minutes when they are soft and translucent add the stock, broccoli and peas and bring to the boil for 3-5 minutes. Test they are ready when the broccoli is still firm and green but also fork tender. Now add the parsley, hummus and parmesan and stir well. Turn off the heat and use a handheld stick blender to blend the soup until it looks thick, creamy and nearly smooth. Add salt and pepper to taste, then return to the heat. As soon as it starts to bubble again, mix together the cornflour and lemon juice and stir through to thicken. Serve and top with roasted chick peas and crumbled feta. Ooh, I love this soup! Especially with those roasted chick peas on top! Thanks so much Liz. This has become a favourite round here and when I can’t resist snacking on those chickpeas all on their own. This looks delicious! Don’t know if the chickpeas would make it to the soup!